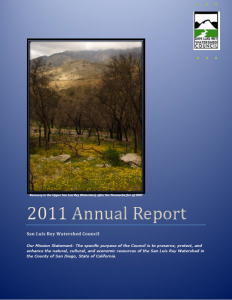 The San Luis Rey Watershed Council prepares an Annual Report for their Annual Meeting, which is typically set for the 4th Monday in October. This report covers the different activities that our group has done for the year, in addition to any outreach events that we may have participated in. We also provide a financial update of the year, and updates on our various members.